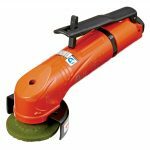 We are pleased to announce the launch of the range extension of the FA-20 series compact Angle Grinder/Die Grinder. The range now matches specific features required by EU, North America and rest of the world, as well as rear exhaust models allowing us extend markets reach. The new models addition are locking lever version, collet version and rear exhaust version to complete the full range. 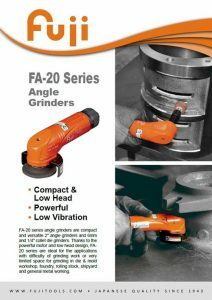 New Fuji FA-20 series are compact and versatile 2″ Angle/Die Grinders. The ergonomic design and powerful motor ensures the operator’s comfort and contribute to improve the efficiency of grinding work. A low head design (7 mm lower than existing models FA-2C series) enables use for applications with difficulties or very limited space for grinding in die and mold workshop, foundry, rolling stock, shipyard and general metal working applications. Whole range of tools are available for purchase globally as of this announcement. For questions regarding this launch, please contact your local Fuji representative or to our marketing department at fuji.international@fujitools.com, Tel: +81 (0)6 6972 2335.